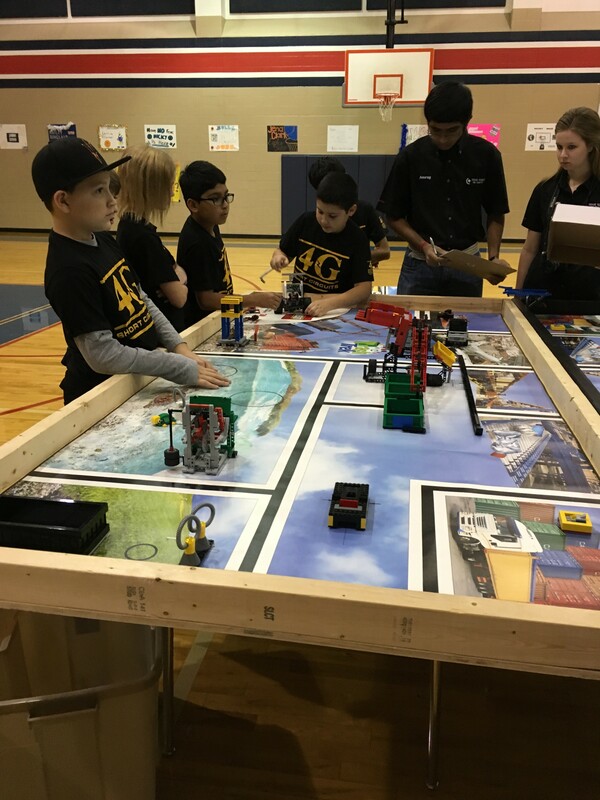 Kids and LEGO and Robotics, Oh My! If you know me well, you know Oracle is my secondary passion. My true passion is my children. I have two amazing, beautiful, intelligent and active boys, ages 7 and 9 (no bias there, I know). Life is never dull, that’s for sure! We are fortunate to live in a area with great schools, with teachers and administration that realize the importance of Science, Technology, Engineering and Math (STEM) education. We have a very active PTO that goes to amazing efforts to raise money so that the school can get the latest technology and programs to help our kids succeed. The whole school participates in the Hour of Code each year, and recently started a Python programming club. Kids actually come to school early to program! They also recently added robotics teams for 1st-6th, and this year my 4th and 1st grader are both participating. I didn’t know much about the FIRST organization before now. They’ve done some Jr. Engineering and Jr. Robotics camps, most recently an excellent one by Woodlands Robotics that they really enjoyed. This led to their interest in participating with the school teams. My oldest is in FIRST LEGO League (FLL), where my youngest is doing FIRST LEGO League Jr for kids K-3rd grade. 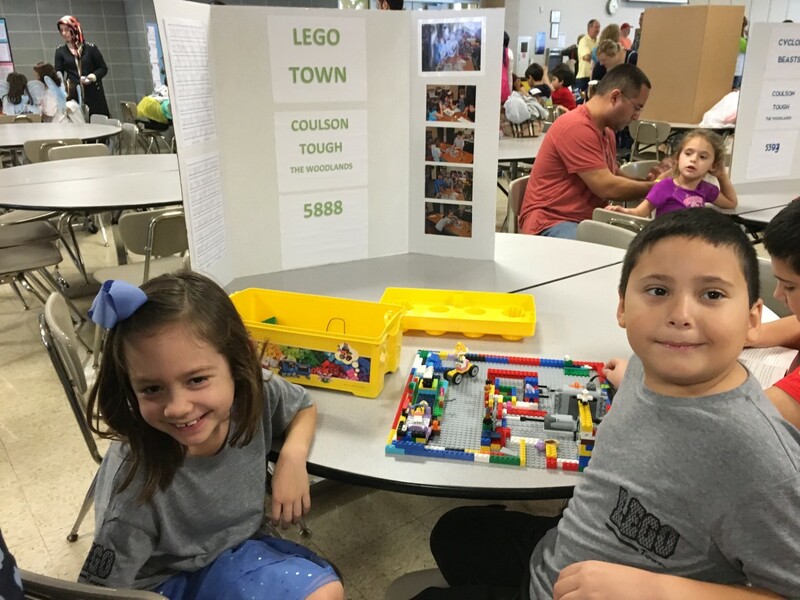 Last weekend the FLL team had their first competition, and there’s only really one way to describe it. Electric. This program is for students in 4-8th grade. Each year there’s a new challenge. This year it’s about trash, and how we can reduce, reuse and recycle. The teams have missions they have to solve with their robot, all worth a certain number of points. They need to work together to decide the best use of their time, and how to program the robot to complete as many missions as possible in 2 1/2 minutes. They are also judged on their core values (discovery, teamwork, gracious professionalism), robot design, and their project. The project is a way for them to show their creativity in how to solve this years challenge. Our team decided that our school could reduce trash by using sporks instead of spoons and forks, and recycling in the cafeteria. The also wrote a rap and performed this for the judges. The team has a sponsor, but all the work is done by the kids themselves. For the robot, they use the LEGO Mindstorm EV3 robot. If you haven’t checked this out, you should. Every techie could fall in love with this. You can build various robot models, with sensors and arms. Then you connect it to your computer and program using a visual block structure. Viola! You’ve got a robot that can play music, move pieces, turn wheels and anything else you can think of! The programming is very flexible, and easy enough once you understand what the components do. 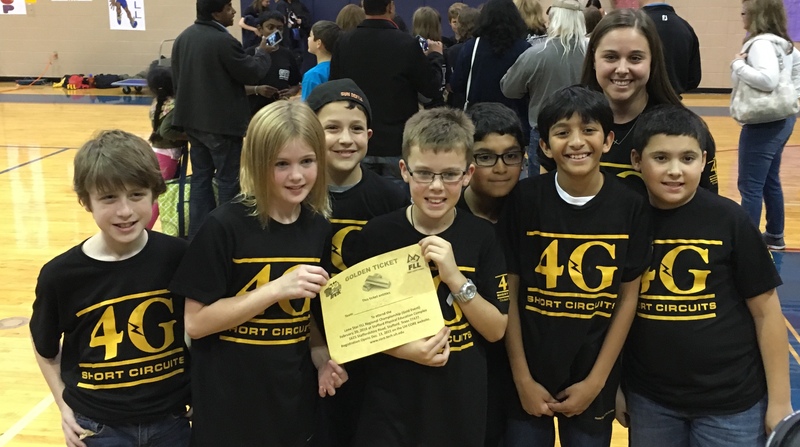 Our team is called 4G Short Circuits. These 6 boys and 1 girl have been meeting 4 hours a week after school since early October. They stepped it up in the last 2-3 weeks adding every day before school for 45 minutes, working through lunch, and extra after school hours. For a while I was a little concerned with how much time he was having to spend on this, he is only 9 after all. With 7 incredibly intelligent kids, one of the things they’re learning is to work together as a team, and communicate effectively. When everybody has a great idea, it’s sometimes hard to get them all out for discussion. Once they work out the kinks here, I think we can expect to see amazing things! I know adults who have a hard time with this concept, so it’s exciting to see the kids working on it so young. We arrived at the competition before 8am on a Saturday. The kids got in a few practice rounds, some hands on experience and advice from the judges, and had a chance to fine tune their programs a bit. It was amazing to see them just go to work and know exactly what they needed to do. Then the kids go in front of a panel of judges for design, project and core values. Finally, the robot games started. There’s three rounds and they keep their highest score. Their first round, things didn’t go so well. The robot went crooked, missed it’s mark, and stalled. You could see the disappointment on their faces. However when the scores were posted, they were still positive and went straight to work on fixing the problems they had. They went into the second round knowing that their final program wasn’t quite right but they’d made some changes and hoped for the best. When they hit 4 out of 5 missions, you could see the pure joy and accomplishment in their faces, and when they were ranked in the top 10, they were beyond themselves! The third round didn’t go as well, and they slipped to 11th place, but these kids remained positive and upbeat the whole time, and that is what I’m so proud of. 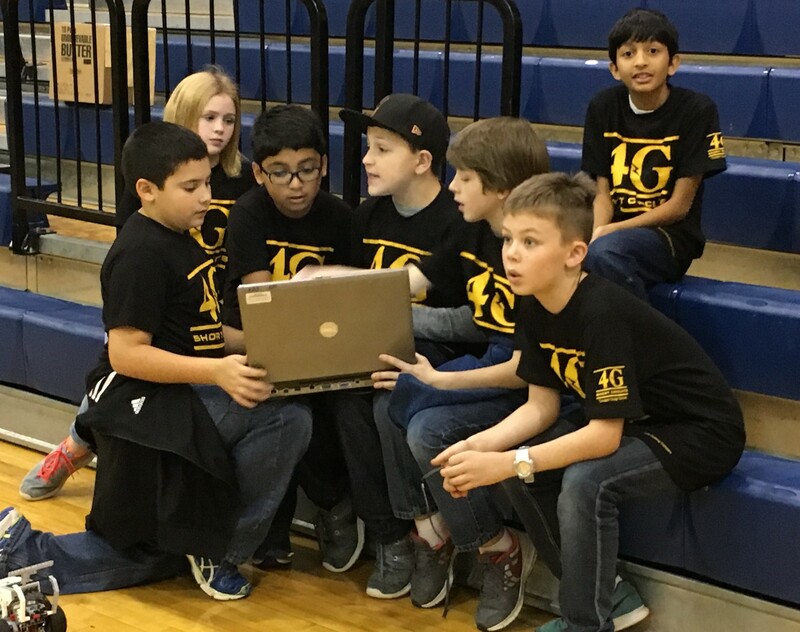 Their first time as a team, first robotics competition and they came in 11th out of 42 teams! They worked so hard to get to this point, just like any sports team when playing a tournament. Although they didn’t win an award, they did earn their golden ticket to the regional competition in February. These 4th graders worked together, worked hard, challenged themselves in areas they weren’t familiar with, and kept pushing until the very end. They never game up, never game in. They were electric. And as a parent in tech, it was so exciting to see the sparks! They’ve got a break for now, but in January they’ll be back in the lab working together to fix those problems and see how many more points they can earn for the next competition! One thing about the competition that stood out, was how diverse the participants were. All ages, races, genders, it was really fun to see so many of the young girls involved with the robotics and programming. The idea behind FIRST was a way to get more kids interested in STEM, by leveraging the sports competition model. I think it’s working! I think back to what I was doing in 4th grade, and it sure doesn’t compare to this! Texas Torque is the high school team who sponsors the FLL competition for our district. I have to say, this was the nicest group of high school kids I’ve ever met. They won the FIRST Robotics Competition World Championship in 2013 and were featured in the documentary Roboleague. It’s an amazing look at how the FIRST league got started, and how bright and amazing these kids are. So, if you have bright, creative, talented children who like to use their mind, check out FIRSTInspires.org and see if there’s an event in your area, or consider forming a team! See my Kids & Code page for more resources!